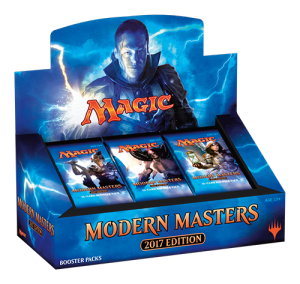 With the release of the packaging for Modern Masters 2017 this past Monday, we’ve got out first Modern Masters spoilers to talk about. While they may not seem terribly exciting or informative, they greatly influence the remaining cards that could be in the set. Let’s go through the conclusions we can draw from the revealed cards, and what future spoilers could mean for some cards you may or may not own yet. 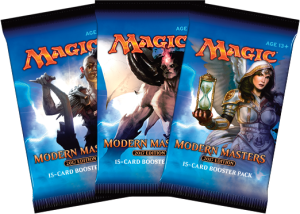 In case you missed it, Wizards posted an article showing the booster packaging and booster box art for Modern Masters 2017 and Amonkhet, the next two sets to be released. There is some pretty obvious information we can glean from the announcement, but also more subtle information that requires some digging to decipher. So far I’ve been irked by a lot of mistaken conclusions I see people drawing. What is particularly interesting about these booster packs is that none of them are cards with new art. Domri Rade is a planeswalker from Gatecrash, Griselbrand is an Avacyn Restored mythic I’m sure most of you are familiar with, and the last card is not a new-art Elspeth (as I’ve seen people mistake her for) but rather Stoic Angel. The first and most common misconception I hear is that because Liliana of the Veil and Snapcaster Mage are not on the booster wrappers, they must not be in the set. That’s not a conclusion I would draw just yet. I want to show you the booster packs from Modern Masters 2015 to explain my point. Although it might be a little hard to see (I couldn’t find a particularly good picture), the booster wrappers for Modern Masters 2015 were Karn Liberated, Vendilion Clique, and Noble Hierarch. They’re definitely more exciting cards than Griselbrand, Domri, and Stoic Angel in terms of price—but they did not dictate the rest of the extremely expensive cards that were put at mythic (Tarmogoyf, the Eldrazi titans, Mox Opal, etc.). There are many reasons why some more expensive and exciting cards were not included as the booster wrapper (including but not limited to making sure the spoiler schedule isn’t messed up), but it remains true that this is not indicative of the quality of the set. I know you might still be skeptical so I’m going to use another more recent example. Do you know what cards were featured on the Eternal Masters booster packs last year? It wasn’t Jace, the Mind Sculptor, Force of Will, Sneak Attack, or Mana Crypt. Not even close! They used Deathrite Shaman, Bloodbraid Elf, and the new art for Goblin Charbelcher. Those are some pretty lackluster cards to highlight in a set with as much value as EMA. The box art did include the new art for Force of Will, however. And on that note, check out the booster box art for Modern Masters 2017. That’s brand new art for a card we’ve never seen before. What does it mean? The past Masters sets used the box to highlight new art for a key card. Modern Masters had City of Brass, Modern Masters 2015 used Etched Champion, Eternal Masters had Force of Will. And as for the spoiled MM17 art—well, it’s probably the new Snapcaster Mage. Many of the previous Invitational cards received new art when they got reprinted. These include but are not limited to Meddling Mage, Shadowmage Infiltrator, Dark Confidant, Solemn Simulacrum, and Sylvan Safekeeper. While we have already seen new art for Snapcaster (on the RPTQ promo), that art choice saw relatively negative feedback and Wizards may have chosen to commission a new piece for MM17. So unless there are any rarity shifts (unlikely, given the three cards we know), Griselbrand and Domri will be occupying two of the 15 mythic spots and Stoic Angel will be one of the rares. Based on the long history of mythic distribution, this likely means there is only one more black mythic. If you read my previous article about my predictions for Modern Masters 2017 mythics, I had Liliana pegged as an easy include and would not have been surprised to see Griselbrand. With only one mythic slot left, there aren’t a lot of choices left. It’s possible Liliana of the Veil isn’t in the set, but if she is, that rules out all the other black mythics I mentioned in that article. Luckily, most of the speculative cards I had listed are more casual cards that aren’t likely to spike if they dodge a reprint. Liliana is not the same. 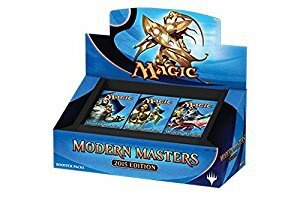 Many people are aware that a Masters set is imminent and have been preemptively selling their copies or waiting to purchase ones that they need. 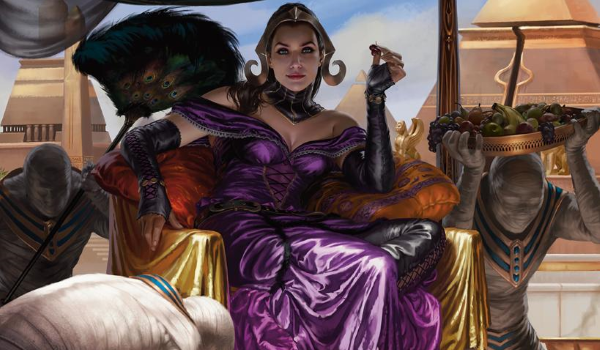 The backlash from a lack of a Liliana reprint could cause her price to skyrocket. Is it likely to happen? I don’t think so—but people have been similarly surprised in recent past. Domri’s inclusion also solidifies one of the usual two planeswalkers that are included in a Masters set. I’m fairly confident they will not deviate from that because the last three Masters sets were constructed in a similar way (MMA had Sarkhan Vol and Elspeth, Knight-Errant; MM15 had Karn Liberated and Tezzeret the Seeker; and EMA had Jace, the Mind Sculptor and Dack Fayden). This confirmation of half of the planeswalkers means that it is unlikely (although, I will stress, not impossible) we see the best-case scenario of both Tamiyo and Liliana reprints. Domri will also be taking up one of the gold mythic slots that are likely limited to two. If we are lucky enough to get Voice of Resurgence as the other mythic, then it’s unlikely there will be any more gold mythics in the set. Conversely, if they spoil something like Olivia Voldaren at mythic, I would start to get worried about Voice of Resurgence‘s chances. Stoic Angel is a very odd inclusion and has a lot of people upset. I understand, it’s not a Modern staple. It’s not even that expensive, so why is it on the booster pack wrapper? While I can’t be 100% sure why they chose the cards they did, the end result is that this kind of card appeals to a different audience. While it’s pretty straightforward that Modern Masters is a set designed primarily for Modern players, Wizards doesn’t want to release a product with nothing for other players. Angels have a high collector and casual appeal—but Stoic Angel might point us in a few other directions too. Let me be frank: the inclusion of Ant Queen and Comet Storm in Modern Masters 2015 didn’t help anyone. Nobody was clamoring for a reprint of either of those. They’re not particularly exciting or good outside of Limited. That said, the Masters sets are designed to be drafted, and Wizards tends to select cards at higher rarity that augment or compliment the Limited themes. Stoic Angel works great with exalted. Her inclusion here is a potential clue that the mechanic is making a return, which could also imply another Noble Hierarch reprint. I want to be clear, it’s no guarantee, but at this point I would shift the odds from “less likely” to “more likely.” I see Stoic Angel as an omen of good things to come rather than a reason we should be extra skeptical. With more spoilers coming before my next article can reach you, there are a few things you can do daily to try to minimize the risk of your collection taking a huge hit. The first is to pay attention to the keywords in the set that get spoiled. It’s not uncommon for a small subset of cards in a set to have a given keyword, so a confirmation of inclusion is more indicative than its absence. Maybe this is a little too vague. Let’s use an example. Say they spoil Reach Through Mists in the set. This could indicate an arcane sub-theme—a mechanic that makes a lot of expensive cards in Modern very awkward to reprint. Do you know what other cards are also arcane spells? Nourishing Shoal, Through the Breach, Goryo’s Vengeance, Desperate Ritual, Lava Spike, and Kodama’s Reach are among the more stand-out examples. Reach Through Mists wouldn’t guarantee any of these cards’ inclusion, but it would merit our consideration. Lava Spike is a $3 common that can be pretty easily buylisted for $1 or so if you get a whiff of arcane spells. It certainly won’t be that expensive if it gets reprinted. Some of the cards I would be more interested in keeping an eye on are Engineered Explosives (sunburst), Ancestral Vision (suspend), Kitchen Finks (persist), Noble Hierarch (exalted), Through the Breach/Goryo’s Vengeance (arcane), Eldrazi Temple/Ancient Stirrings (Eldrazi spells), and Inkmoth Nexus (infect). It’s unlikely we will see the commons with a keyword before a rare, but you can still save yourself a few bucks if you see a spoiled rare (even a bulk rare) that would work well with a pricey common or uncommon. Unfortunately, some of the higher-demand cards don’t really get influenced by keywords. Goblin Guide, for example, could just be in the set with no support. It’s not unheard of (remember Daybreak Coronet?) but it’s also hard to predict. The one thing I’m going to try to hit home is not to panic-buy anything. If you need the cards to play with, then go buy them now and don’t worry about it. With Eternal Masters, a lot of people noted that Show and Tell, one of the few non-Reserved List cards in the Sneak and Show deck, was conspicuously missing from the set. At the time I made mention that it could be in Conspiracy 2 because it was a card that played well with the multiplayer draft format. As it turned out, that’s exactly what Wizards had planned. While it’s improbable that every card left out of MM17 will be in a supplementary product, I would stress the importance of considering the future. Wizards of the Coast is constantly printing cards, and unless you need something right away it will save you more money to just keep waiting and be patient. It’s unlikely we will get every reprint that everyone wants in this set, but hopefully there will be enough to help curb the costs of Modern! A man needs damnation reprint. Chalice of the Void wouldnt be terrible either these days. Insightful as always Jim. What would be your top three picks for uncommons?